This wasn't how we envisioned it. We envisioned having the most eco-friendly and healthy products at our disposal (and within our budget) but we've learned that done is better than chasing perfection. With the subfloor joists framed and the insulation in place, Alhen covered the full-length of the bus floor with a radiant barrier [link] and we started on the plywood. We chose tongue-and-groove OSB subfloor boards for (what we assumed would be) easy installation. Alhen had hours of work done on SketchUp designing and perfecting the measurements of the boards so we felt we would be in great shape. Many, many little hang ups we couldn't forsee. We're so ready to have the subfloor finished. 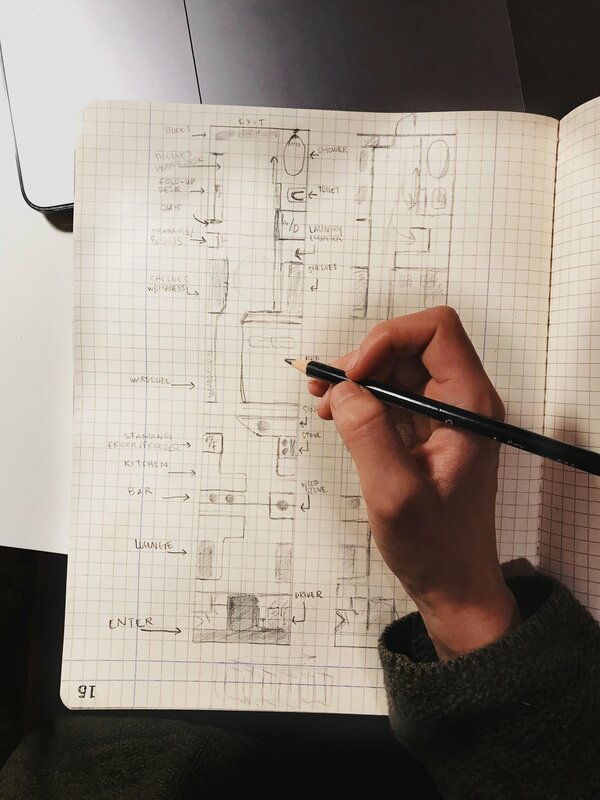 We're ready to tape down the layout, start big projects like electrical and plumbing, and start acquiring appliances that are going to make this DIY project a home. But, we're continuously reminded that this is a learning process. The greater the challenge, the greater the triumph. What keeps us going (and really, it's what keeps Alhen going and reminding me through my freakouts), is the prospect that when this is complete, we will have accomplished not just a major dream, but an enormous foundation for the rest of our lives. We're halfway through the subfloor, but it'll rain this weekend. Physical labor is on hold, but there's plenty to do. That means there will be perfectly quiet and peaceful lengths of time for endless cups of hot tea and sketching the layout! Designing a tiny living space is less about sacrifice and more about specificity. Where we will do what, how often, and what we need in that space to make it comfortable. That's what I'll be working on this weekend, so when the OSB is down, we can get started making this a home. We want to hear from you: What's the most important place in your house?